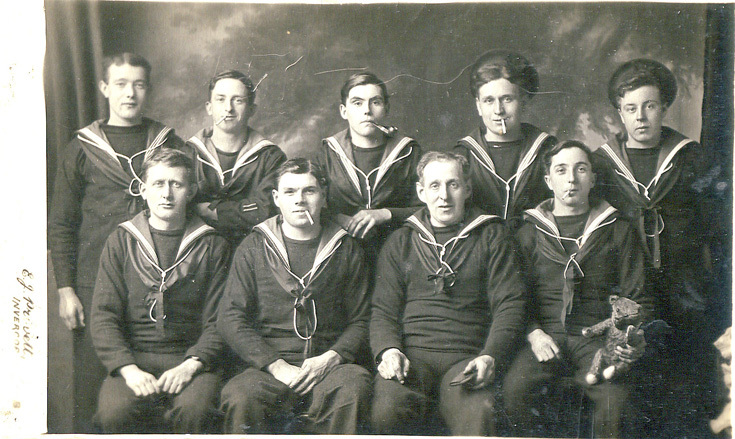 Picture taken in Invergordon around 1914-1918, while our grandfather was stationed there. Angus Martin (holding Teddy Bear). Angus Martin married Mary Ann Dunn in Invergordon on March 21, 1917. Lots of smoking going on here. In addition to a rum rations, RN sailors were sold ciggies at very low prices right up until the 1960's. When the fleet was in the streets of Invergordon were strewn with discarded Capstan & Players packets marked " HM Forces". Hi John, I think that HMS Victory at Invergordon was a shore base facility no ship but supplies and maybe training. HMS Victory was the Royal Navy barracks at Portsmouth (not to be confused with Nelson's flagship). Shore establishments had to be designated as ships in order to comply with the Naval Discipline Act. Victory Barracks was renamed HMS Nelson in 1974. Sailors continued to enjoy limited duty-free tobacco (tickler) up until December 1991.